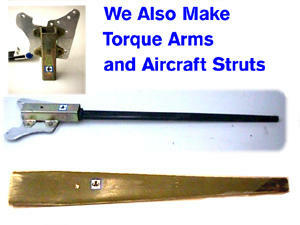 We make fiberglass leaf springs for just about any need- Automotive, Marine Aeronautic and for custom applications. We generally make two arch sizes in varying rates. Depending on your requirements, we can either raise or lower your vehicle. We can make custom springs based on your specific weight, rating, application and size. Please check out our redesigned form to determine what information we need. After we get and confirm your order, it generally takes us a couple of weeks to get your springs made and ready to ship; Sometimes a little less. Shipping is via UPS ground and varies depending how far away you are from Anderson, South Carolina, USA. Each order is priced after specifications are finalized. All orders are taken on a pre-paid basis. Please note that custom applications will cost more. That price will depend on the time we need to spend in Research and Development. Please contact us for details. The replacement composite leaf spring and aluminum spring eyes, polyurethane bolt bushing with steel insert made to attach the bolt size you specify. 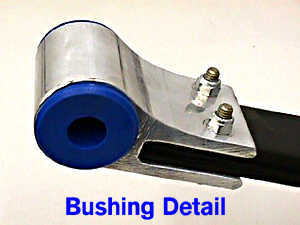 Fiberglass Leaf Springs are ready to bolt in- You provide the BOLTS. One of our springs weighs around 8 pounds. A steel spring can weigh as much as 45 or more pounds. You do the math OK! We warrant the springs to be free from defects in material and workmanship for a period of one year from the purchase, providing you cover the cost of shipping. We have had our springs on race cars that have lasted five years. Warranty does not cover abuse, wrecks etc. Our other suspension products are mostly custom designed for specific purposes. Send us an E-mail message for more details. Flex-Track - Our unique torque arrestor system designed to work with our Flex-A-Form suspension products will absorb the added torque from your wheels and direct the force instantly to the ground. Flex-Track produces up to thirty percent better starting torque while weighing less than ten pounds! Flex-Track Keep your Wheels where they OUGHT TO BE - On The Ground! E-mail us for aditional information.